National Neonatology Forum of India has developed standardized Teaching Aids through an elaborate process of consultation and pilot testing on Newborn Health in India. These consist of slides and matching manuscript on 12 common topics . Teachers of Medical & Nursing Schools will find this useful for teaching undergraduate medical & nursing students. Strengthening of education and training of physicians and nurses in neonatal care is an important pre-requisite for a successful march toward the national child health goals. In recent years, a consensus on core competencies to improve newborn survival at the primary and secondary levels has been developed - thanks to the leadership of the National Neonatology Forum. The previous edition of the Teaching Aids incorporated these agreed evidence-based contents. That module was a remarkable milestone because of many reasons. The precision of messages and the quality of the text and the slides received well-deserved accolades from all quarters. The 'Teaching Aids' helped in standardizing teaching in newborn care in pre-service, in service and continuing education programs. NNF incorporated this learning resource in the district training program organized on behalf of the Government of India in over 80 districts. Almost ten years later this extraordinary product has now been further updated, refined, perfected and embellished. The present version of 'Teaching Aids' has been aligned with contemporary technology with power point format, CD-ROM version and web based dissemination plans. I congratulate the contributors and reviewers for their inputs. Dr. Ashok Deorari and his editorial team at AIIMS deserve credit for not only coordinating this huge team effort, but also for meticulously putting the text and visuals together, and thereby turning a great concept into a user-friendly reality. Neonatology Forum of India has realized the need for creation of a uniform standardized teaching material for health professionals. I feel privileged to present a set of teaching aids on twelve common newborn topics along with the matching manuscript for undergraduate medical, nursing students and general duty medical officers. 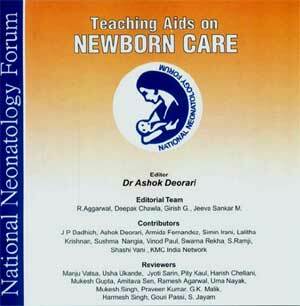 This task would not have materialized without co-operation from a large number of NNF resource faculty members and senior NNF members who have field tested the slides and the manuscripts.This revised edition has been brought out with inputs from all previous contributors and several NNF members. A number of suggestions made by them on the earlier edition have been incorporated. Four more topics viz. Newborn health in India, Kangaroo Mother Care, Post asphyxia management and transport of sick newborn have been added after pilot-testing. We plan to widely distribute the revised and updates materials throughout the country, which we hope would go a long way to ensure rational management of common neonatal disorders and enhance newborn survival. I would like to express appreciation to Mr. Sanjeev Negi for diligently typing the manuscript and Mr Narender Singhal for designing slides. Kindly note, that your suggestions and comments are invaluable. This will improve teaching material for future use.